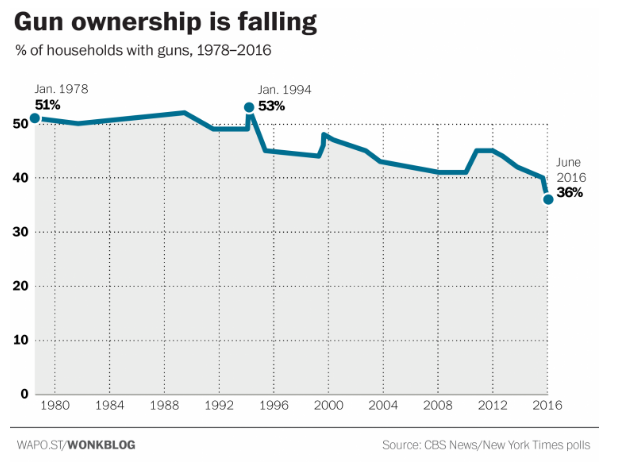 The percent of American households owning guns is at a near-40 year low in the latest CBS News poll released this month . According to the survey, which was conducted among 1,001 Americans in the aftermath of the Orlando nightclub shooting, 36 percent of U.S. adults either own a firearm personally, or live with someone who does. That's the lowest rate of gun ownership in the CBS poll going back to 1978. It's down 17 points from the highest recorded rate in 1994, and nearly 10 percentage points from 2012. Different national polls tend to show slightly different rates of gun ownership. The latest household gun ownership rate in the General Social Survey, in 2014, was 32 percent . The October 2015 Gallup survey showed a higher rate of 43 percent , including guns kept on property outside the home. But the downward trend in gun ownership remains consistent across the national polls. According to Gallup, gun ownership has fallen by about 10 percentage points since its peak in 1993 . The General Social Survey shows a 20-point drop since the mid-1970s . But gun purchases, as measured by FBI firearm background checks, are at historic highs . And data from the Bureau of Alcohol, Tobacco and Firearms shows that gun manufacturers are churning out record numbers of guns . Many gun rights advocates argue that these figures mean that the overall number of gun owners is growing: If more guns are being sold, more people must be owning guns. But the declining rates of gun ownership across three major national surveys suggest a different explanation: that most of the rise in gun purchases is driven by existing gun owners stocking up, rather than by people buying their first gun. A Washington Post analysis last year found that the average American gun owner now owns approximately eight firearms , double the number in the 1990s. Other research bears this out as well. A 2004 survey found that the average gun owner owned 6.6 firearms , and that the top 3 percent of gun owners owned about 25 guns each. More recently, a CBS News poll taken in March of this year found that roughly 1 in 5 gun owners owned 10 guns or more . Gun owners remain a potent political force in the U.S., due largely to the successful efforts of advocacy groups like the NRA. But survey data showing declining gun ownership suggests that the NRA has been successful largely by channeling the energy and intensity of an existing gun-owning base, rather than by broadening that base and bringing more supporters into the fold. If declines in ownership continue, the group could have a hard time replicating recent successes in the coming decades.